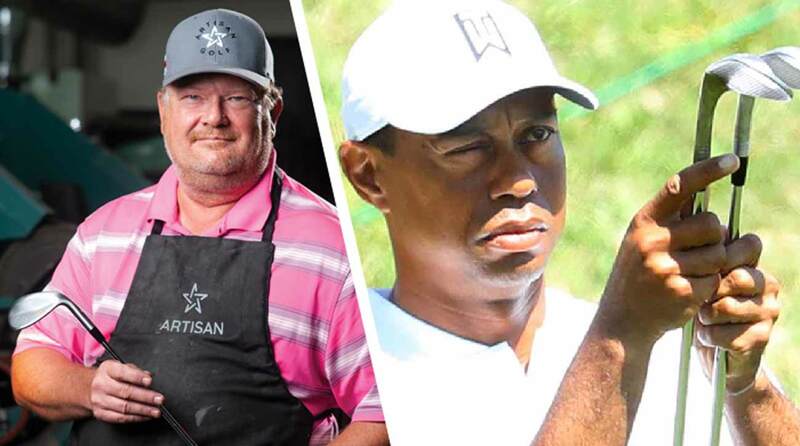 Master craftsman Mike Taylor has been a part of Tiger Woods’ equipment life going back to Nike’s first foray into the club business. In Swoosh-speak, Taylor is Tinker Hatfield to Woods’ Michael Jordan, creating iconic irons and wedges for one of the greatest ball-strikers of all time. When Woods departed for TaylorMade in 2017, Taylor, who helped create Fort Worth, Texas-based Artisan Golf, came along in a consulting role to help with the vision of Woods’ irons and wedges. But when Woods switched from TW-Phase1 irons to the milled P-7TW prototypes at the beginning of 2019, it was unclear if Taylor was still playing a part in the design and grind process. Tiger Woods and Mike Taylor have been working together on clubs for quite some time. Because the milled sole on Woods’s irons and wedges is identical to what’s currently found on TaylorMade’s Milled Grind wedges, which are individually CNC milled on a machine to ensure accuracy and consistency, many questioned if Taylor still had a place at the table. Woods confirmed during an interview with GOLF that Taylor is, in fact, still involved. In fact, he revealed the two still talk regularly on the phone about club design. You can read GOLF‘s complete interview with Woods here.